Outer Space Raiders | They Might Be Gazebos! 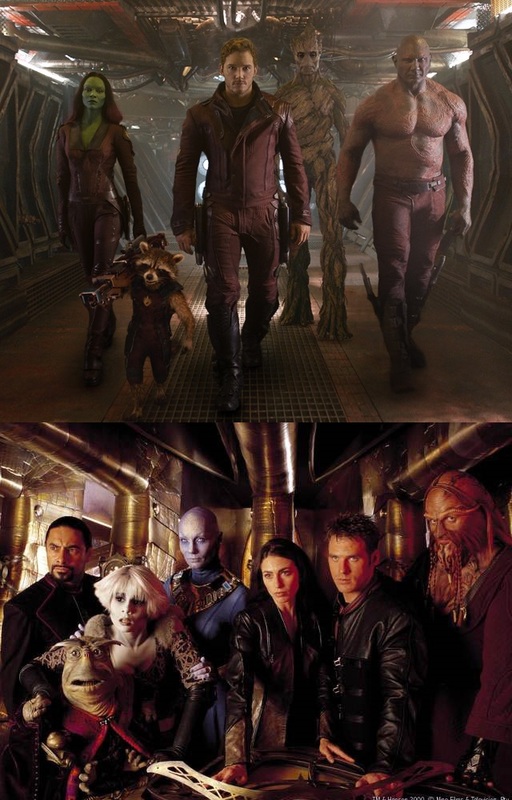 Guardians of the Galaxy 2. Hell’s YEAH! Yes, I’m late to rant about this one. But hell’s yeah. I really loved the first movie. I liked it better than Force Awakens. And like a few others(like here, here and here) thought it was best the damned Farscape movie ever. Which again isn’t a bad thing. Because I love Farscape. With all that bouncing around inside my head, the old hankering to run a Space Opera game is in the back of my mind. I know that Dungeon Crawl Classics is up next and that is going to be a blast. But heck I’m the sort of person that always has too many irons in the fire. To honest, I still don’t know what freaking system to use. The top contenders are of course: White Star (kit bashed with a few other OSR SF games). Savage Worlds, and the good old d6 system. Who knows may get a really wild hair and try to create some sort DCC space opera thing if the up coming campaign world really well. Time will tell. Now back to prepping for DCC. Oh yeah and if you haven’t seen the trailer. Here you go! Die drop charts are cool and easy to use. Heck, it even adds a little bit of extra tension when rolling. So here’s a quick little idea that popped int my head. A die drop for space ship hit locations with a few little complications thrown in. 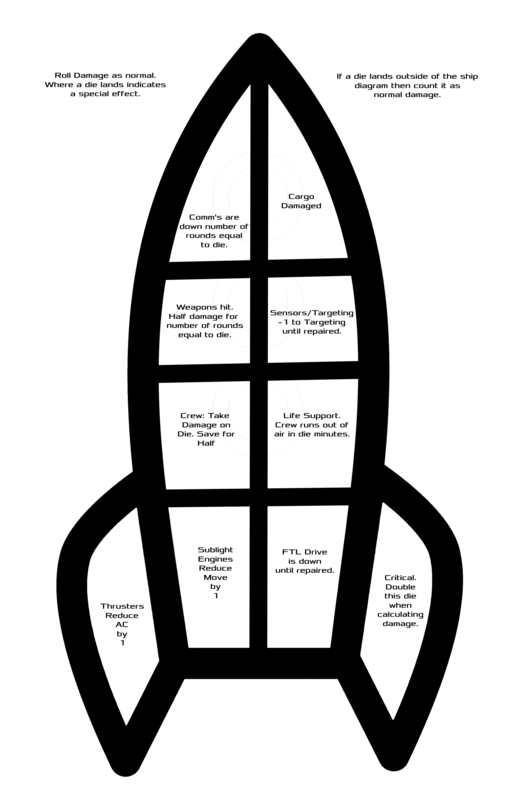 Since White Star has become my OSR space opera game of choice, this works pretty well. Just drop the d6’s like you’re rolling normally and see where the dice land. And another title goes up on RPGNow. 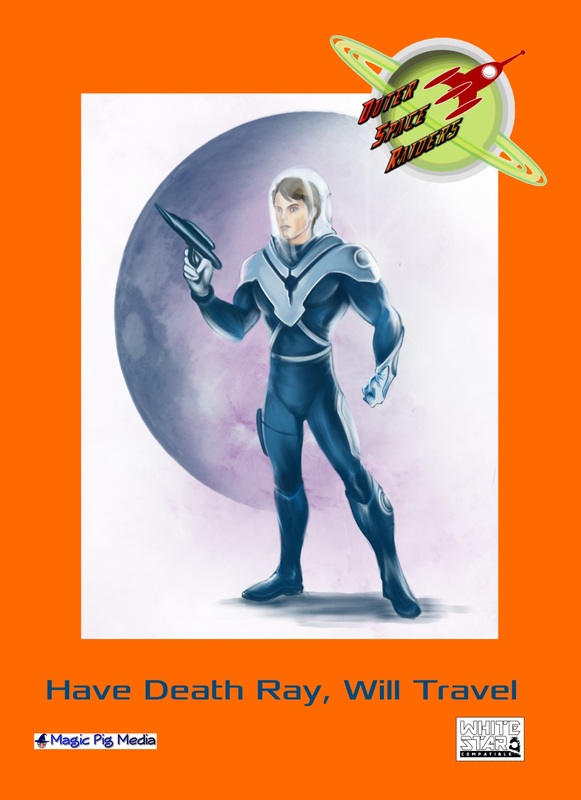 Have Death Ray, Will Travel is a retro-future setting inspired by old pulpy serials, Sword & Planet adventures, the Wild West, and film noir. Want exploration? Want political intrigue? Like the Wild West with ray guns? Want a little gritty film noir? Bounty hunters? Space pirates? Gangsters? Alien emperors out to conquer the universe? It’s all there. And yes. It’s for White Star. With luck I should have some more White Star news this week. Plus there’s more good things I’m working on. They’re just not White Star. So stay tuned for those announcements. 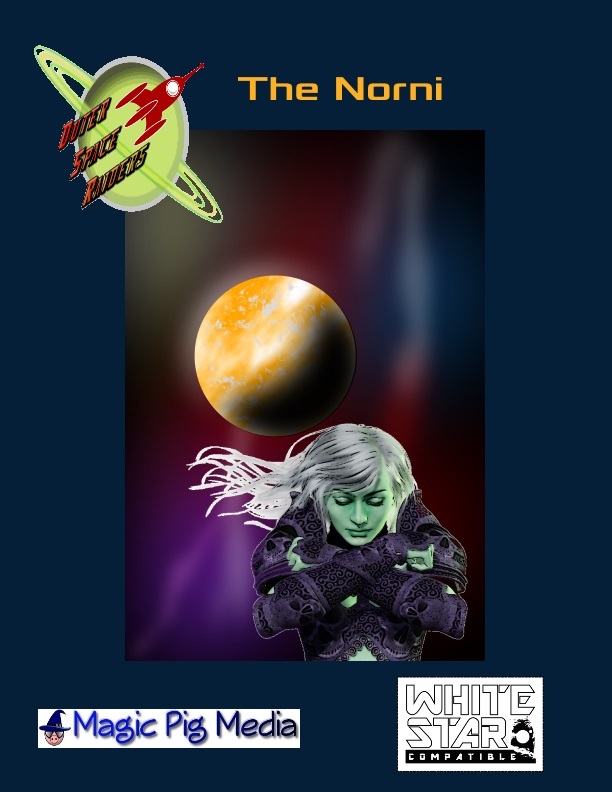 Well, I got another alien race for White Star up on RPGNow, The Norni and there’s more to come. I’m working on what I hope to be some fun stuff for White Star. A couple adventures are bouncing around inside my head as well as a mini campaign setting. First, there’s going to be my own little optional rules supplement. So stay tuned for that. And there’s plenty of other RPG stuff in the old brain pan. I don’t want to say too much yet because every time that I do that something crazy happens. So I’m going to play it close the chest until the drafts are almost done. But in the mean time, you can still following and maybe you might see a hint now and then about those upcoming mysteries. Another alien race for White Star or other old school space opera game. This one is a lot more tongue in cheek than most of the stuff I’ve done but this one was a lot of fun. So ahead and check it out. There’s more great stuff to come. You can grab it up at RPGNow. It was a busy weekend but here you go. Over twenty monsters for your old school space opera campaigns. From the bizarre Pulsarites to the deadly Warp Beasts. Brave an encounter with the reality altering Quantum Ooze! Escape the clutches of the Radioactive Lust Vampires! And just because you’re inside a space ship, it doesn’t mean you’re safe from the Cosmic Behemoth or the Star Kraken. Plus a random Bug-Eyed Monster generator and three new starships. Compatible with White Star: White Box Science Fiction Rolelpaying by Barrel Rider Games. And here’s the second product to for White Star. 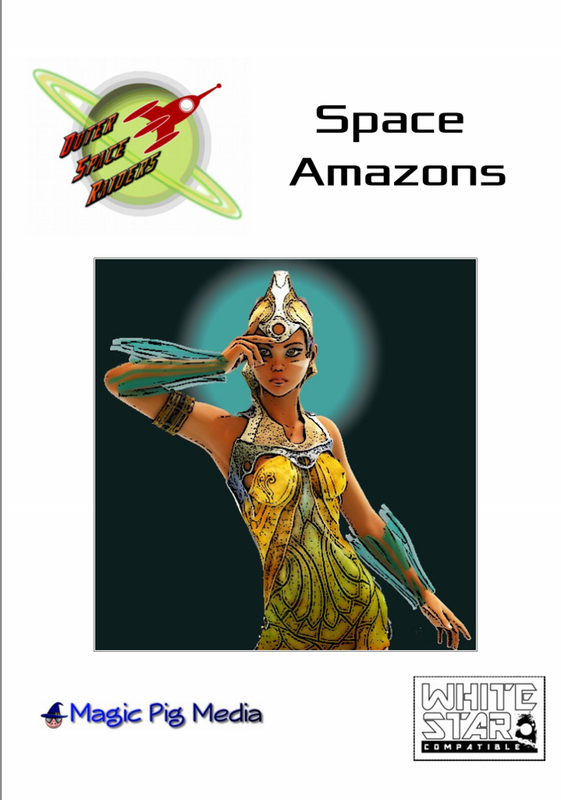 Space Amazons! That’s right old fashioned space opera stuff that’s just a little gonzo.